alaTest a collecté et analysé 24 avis de consommateurs et d'experts pour le produit Panasonic DMP-UB400. La note moyenne du produit est 4.3 sur 5, tandis que les autres produits de même catégorie ont une note moyenne de 4.0 sur 5. Les testeurs apprécient le design. Après analyse des notes de consommateurs et d'experts, de l'âge du produit ainsi que d'autres facteurs, et comparé aux autres produits de même catégorie, le Panasonic DMP-UB400 obtient un alaScore™ de 94/100 = Excellent. Of all the electronics giants, Panasonic is by far the most committed to 4K UHD Blu-ray. 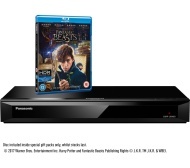 It was the first to put out a 4K Blu-ray player, the £600 Panasonic DMP-UB900, which has been one to beat since 2016. An excellent budget 4K Blu-ray player – it won't disappoint. brought to replace 4k upscaling blu ray player(also Panasonic), and the improved picture quality on all levels, was well worth the extra cost. We have a Panasonic TV so i wanted a Blu-Ray that could easily connect with it. I wanted to UB700 as it was very highly reviewed and Very cheap in the sale but JL were out of stock so went for the newer UB400 instead. Everything works well, no complaints.